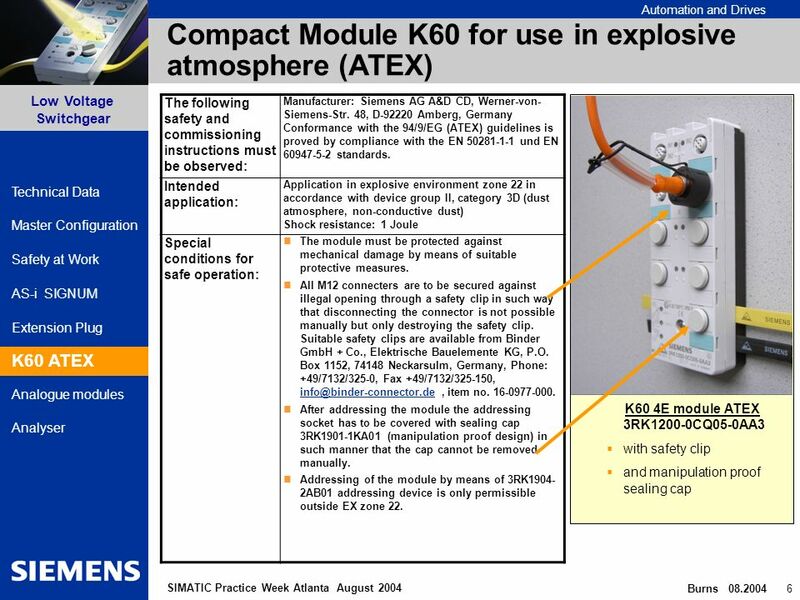 Automation and Drives Safety at Work AS-i SIGNUM Extension Plug Low Voltage Switchgear Burns 08.2004 1 Master Configuration K60 ATEX Analogue modules Analyser. 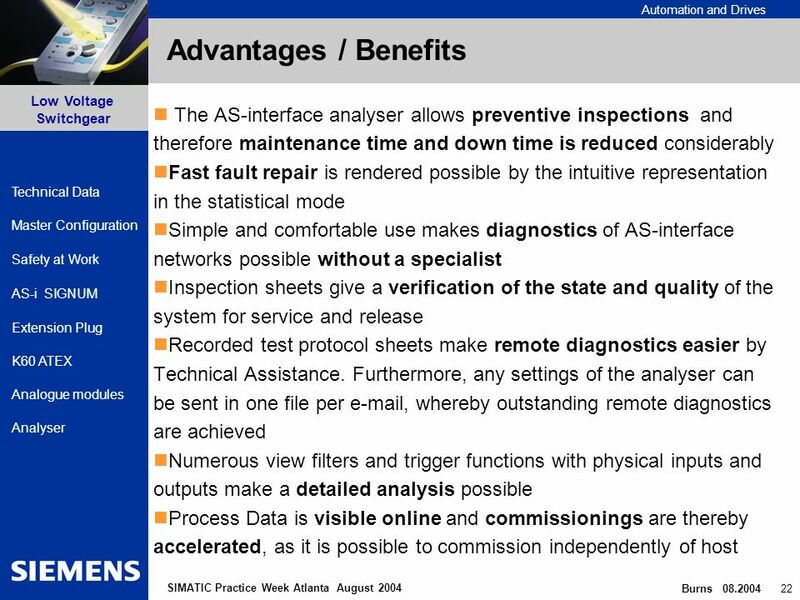 2 Automation and Drives Safety at Work AS-i SIGNUM Extension Plug Low Voltage Switchgear Burns 08.2004 2 Master Configuration K60 ATEX Analogue modules Analyser Technical Data SIMATIC Practice Week Atlanta August 2004 AS-i Extension Plug Extension Plug Function of the Extension Plug Ordering data To build a AS-Interface segment longer than 100 m up to 200 m install the extension plug at that point in the network which is most distant to the AS-Interface power supply. 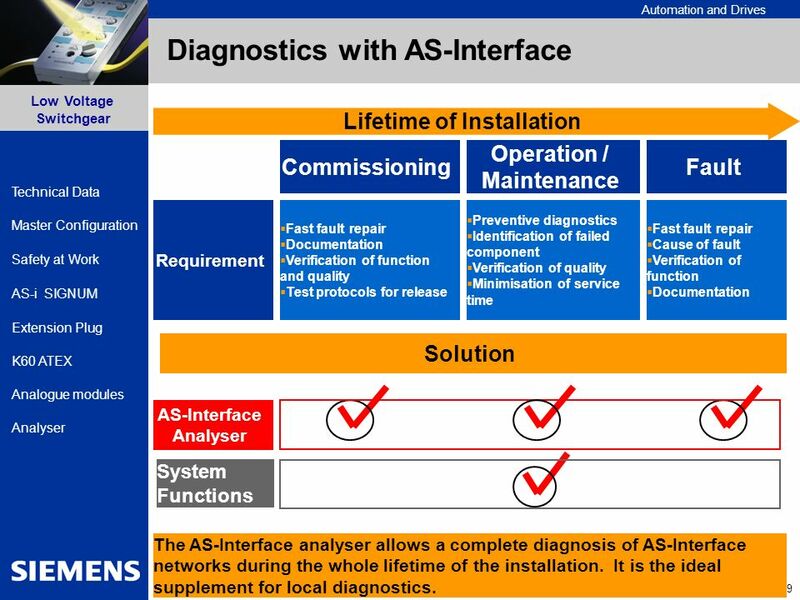 It is not necessary to locate this point exactly, as it is sufficient to install the extension plug close to this point (approx. 10 m). 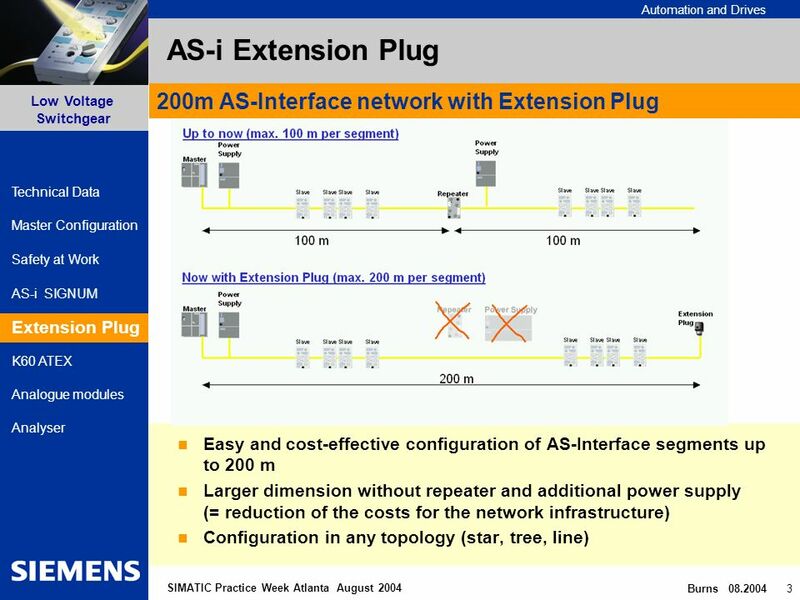 Using the extension plug you may build AS- Interface networks in any topology (line, star,tree). 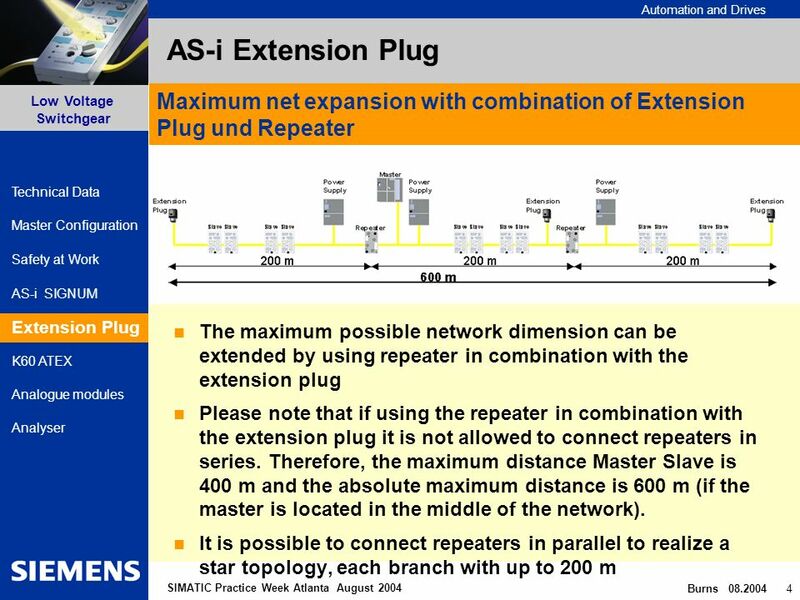 You always need just one extension plug per segment even if you use star or tree structure. 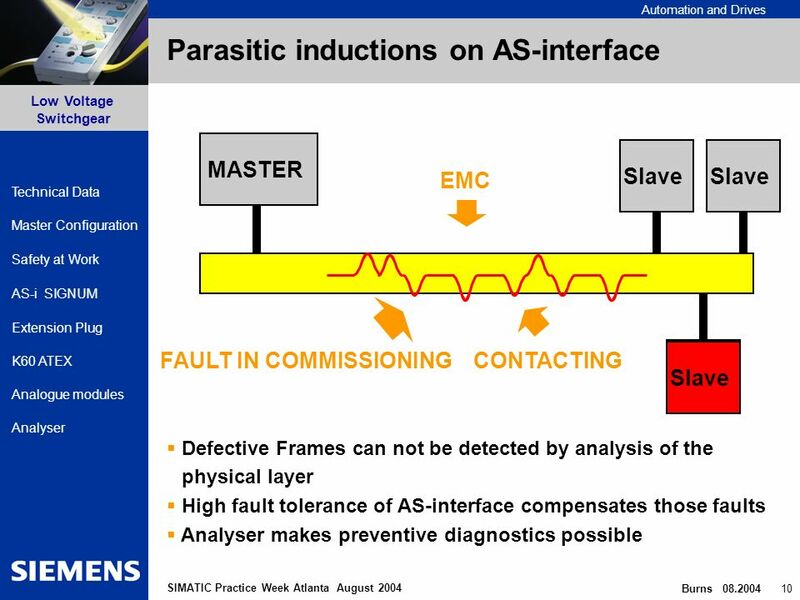 Depending on the length of a AS-Interface segment and the needed current (depending on the number of connected slaves) you have to consider the voltage drop along the AS-Interface cable. 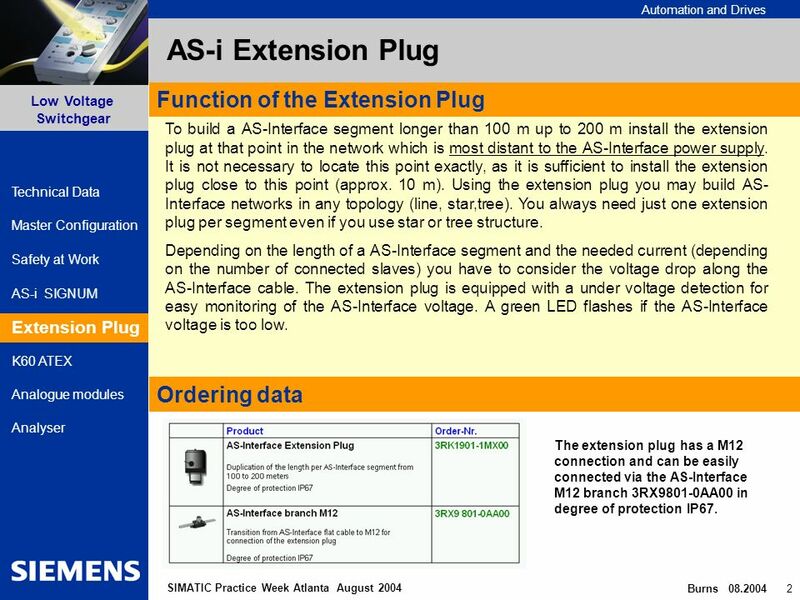 The extension plug is equipped with a under voltage detection for easy monitoring of the AS-Interface voltage. 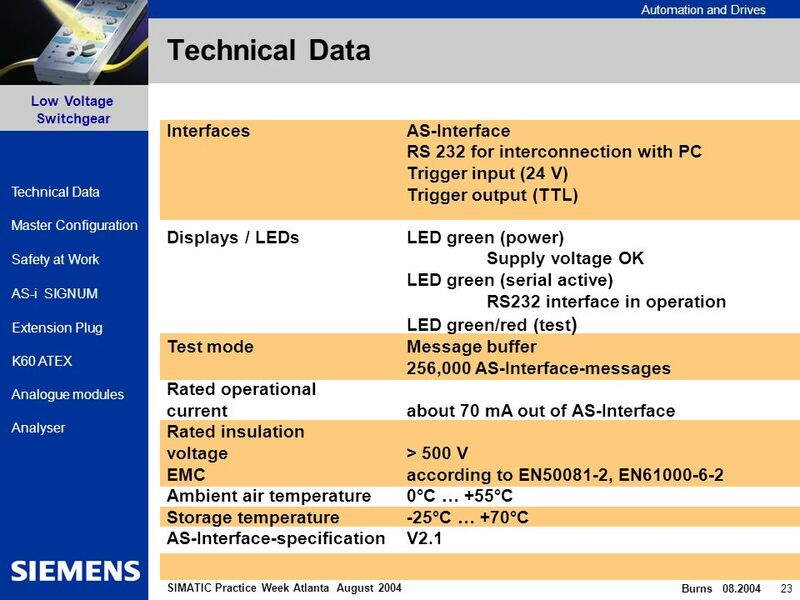 A green LED flashes if the AS-Interface voltage is too low. 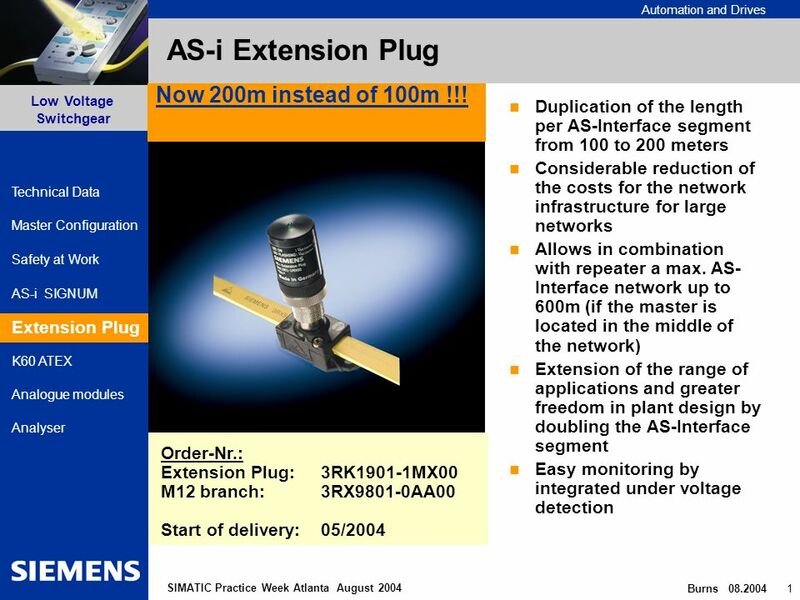 The extension plug has a M12 connection and can be easily connected via the AS-Interface M12 branch 3RX9801-0AA00 in degree of protection IP67. 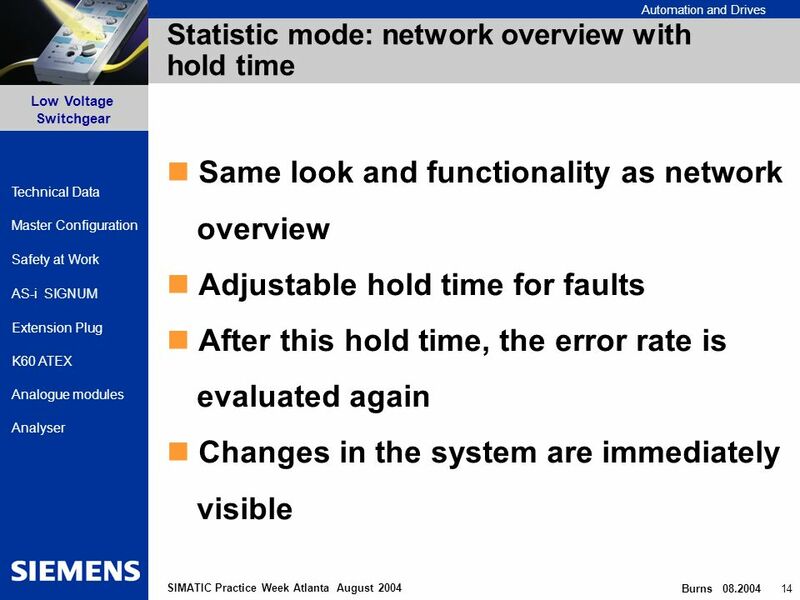 12 Automation and Drives Safety at Work AS-i SIGNUM Extension Plug Low Voltage Switchgear Burns 08.2004 12 Master Configuration K60 ATEX Analogue modules Analyser Technical Data SIMATIC Practice Week Atlanta August 2004 Modes TRACESTATISTICS ONLINE ANALYSIS Simple Overview Statistic Analysis of Failures Overview of available Slaves Representation of Slave Data and IDs DETAILED Analysis Setting trigger conditions Observe Communication on these conditions Start the communication record Detailed Analysis of failures with trace filters Complete Installation does not work correctly- WHAT IS THE REASON? 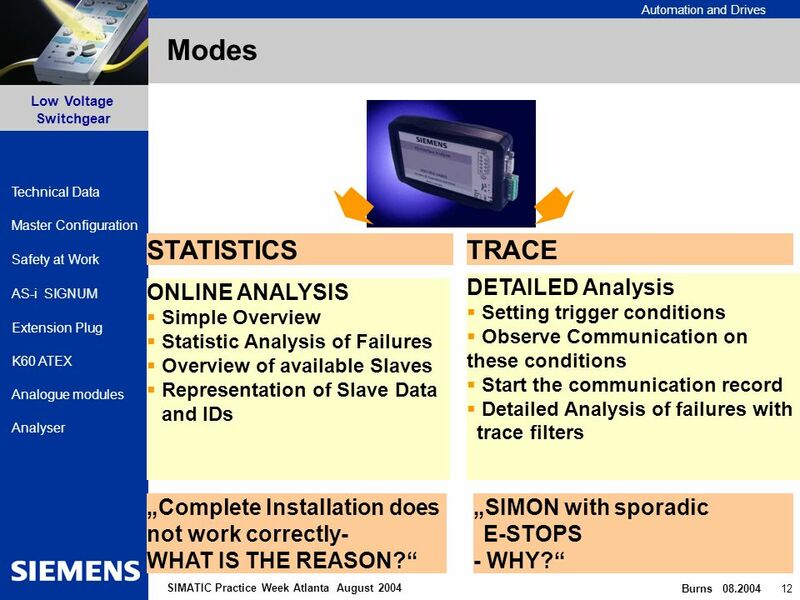 SIMON with sporadic E-STOPS - WHY? 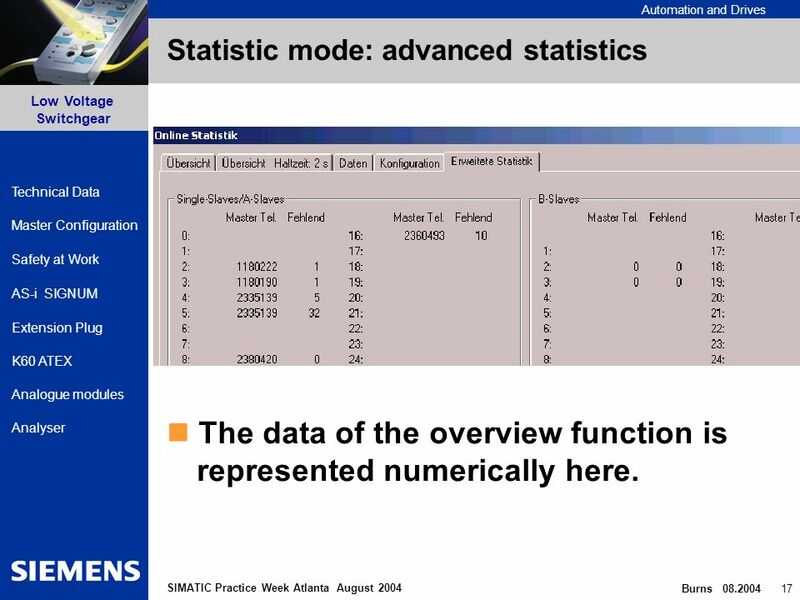 17 Automation and Drives Safety at Work AS-i SIGNUM Extension Plug Low Voltage Switchgear Burns 08.2004 17 Master Configuration K60 ATEX Analogue modules Analyser Technical Data SIMATIC Practice Week Atlanta August 2004 Statistic mode: advanced statistics The data of the overview function is represented numerically here. 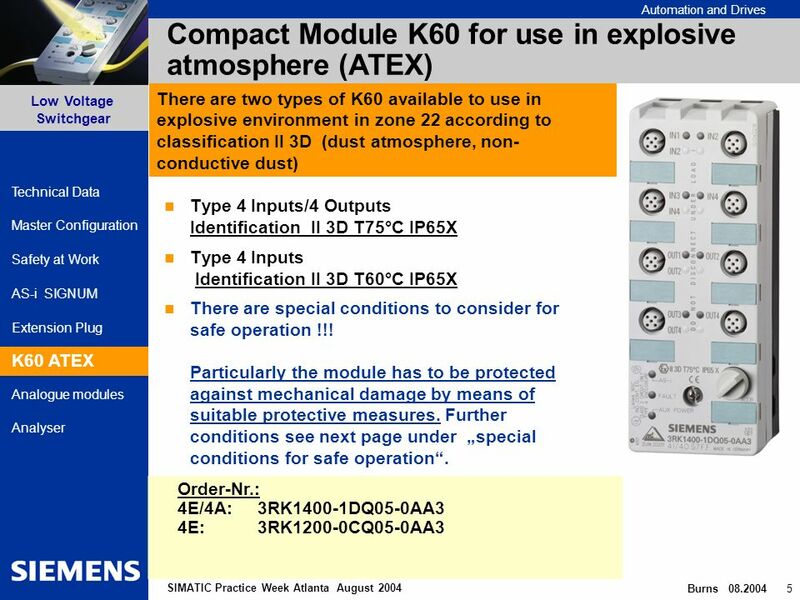 Download ppt "Automation and Drives Safety at Work AS-i SIGNUM Extension Plug Low Voltage Switchgear Burns 08.2004 1 Master Configuration K60 ATEX Analogue modules Analyser." 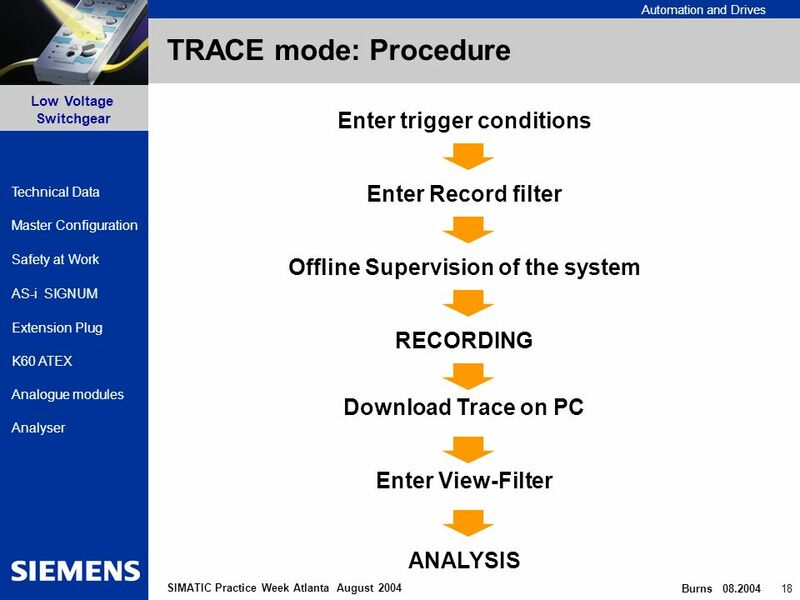 PressureGuard Module One - Introduction. LED Drivers Al Marble Manager, Sales & Market Development January 2010. 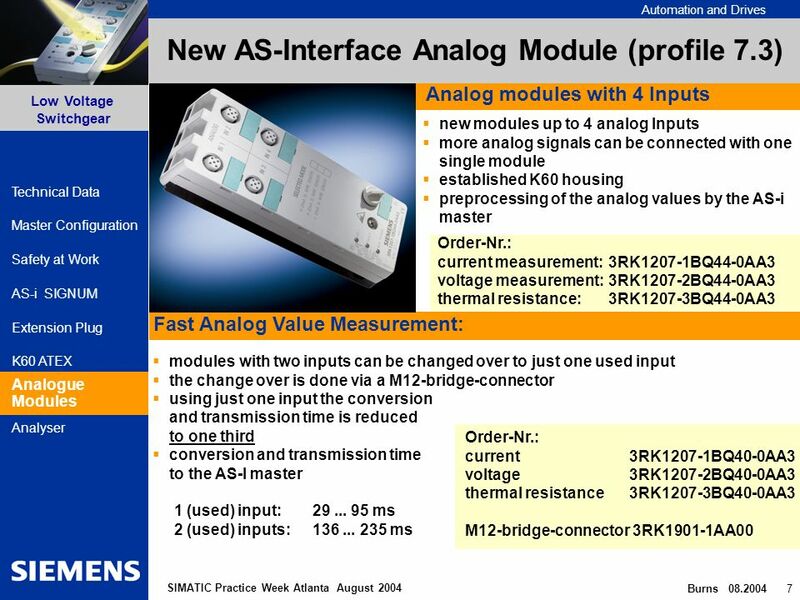 Automation and Motion IEC Control Marketing, , 1 Safety Integrated® Topics for today. 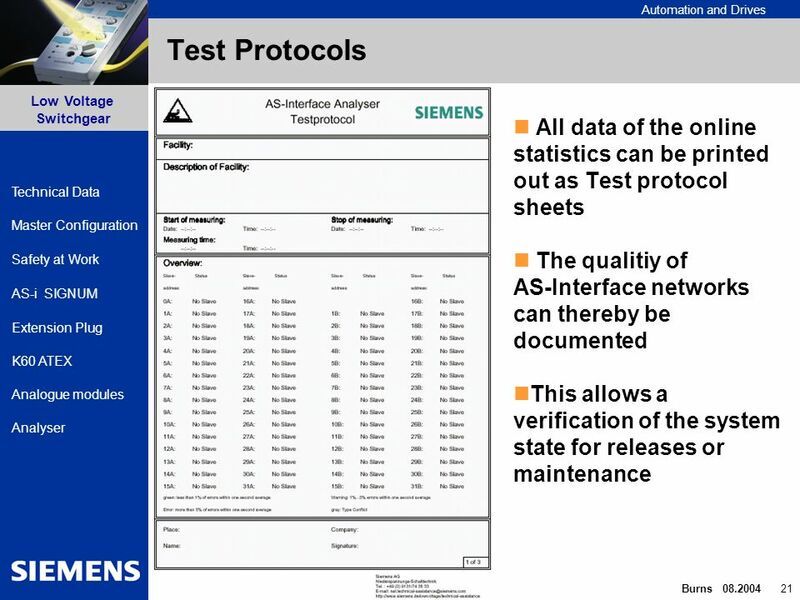 Masterclass 2001: Safety Integrated Excellencein Automation&Drives: Siemens Folienthema/Folie 1/Jahreszahl Name & Department AS-Interface Safety now included! 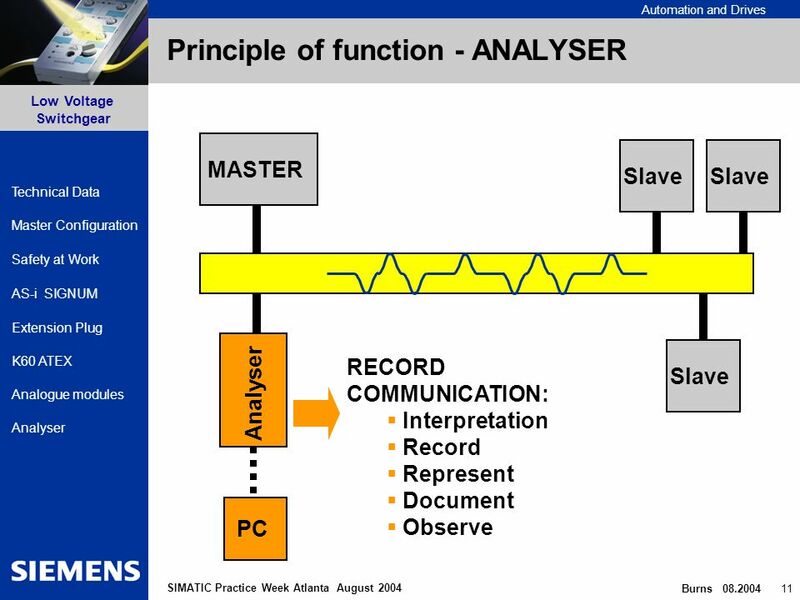 Die Welt der automatischen Schmierung perma MINI DB/uf. 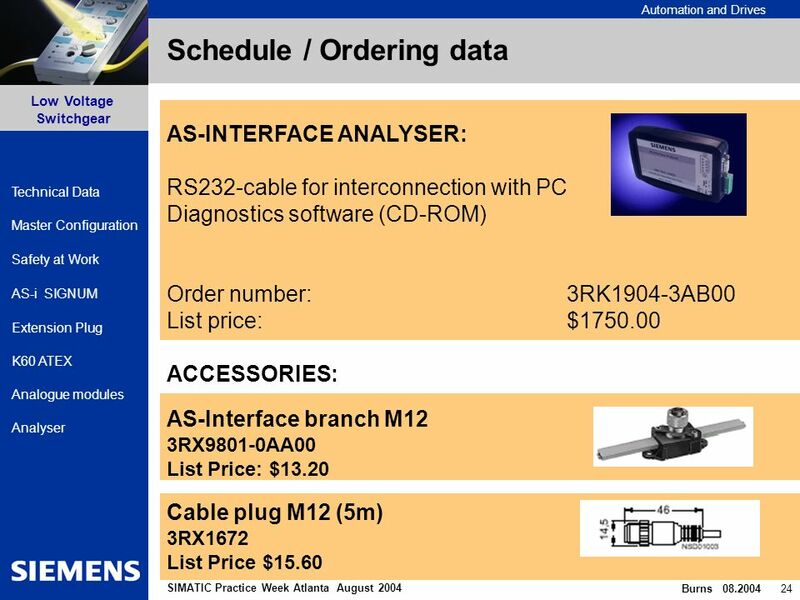 GG-Kennung oder Produktname Low voltage switchgear AS-interface Analyser AS-Interface. 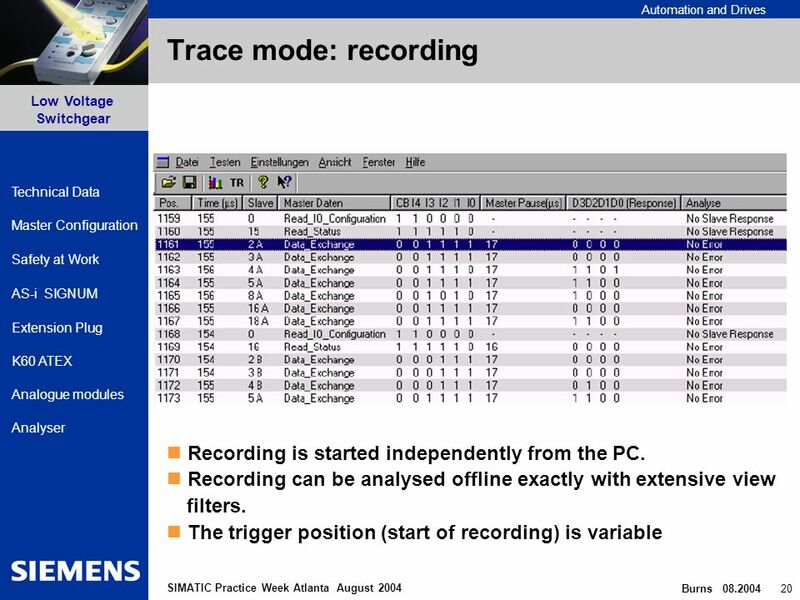 As a stand-alone overview of test tools. DC DATACOMM John Abbott College JPC Network Management M. E. Kabay, PhD, CISSP Director of Education, ICSA President, JINBU Corp Copyright © 1998. 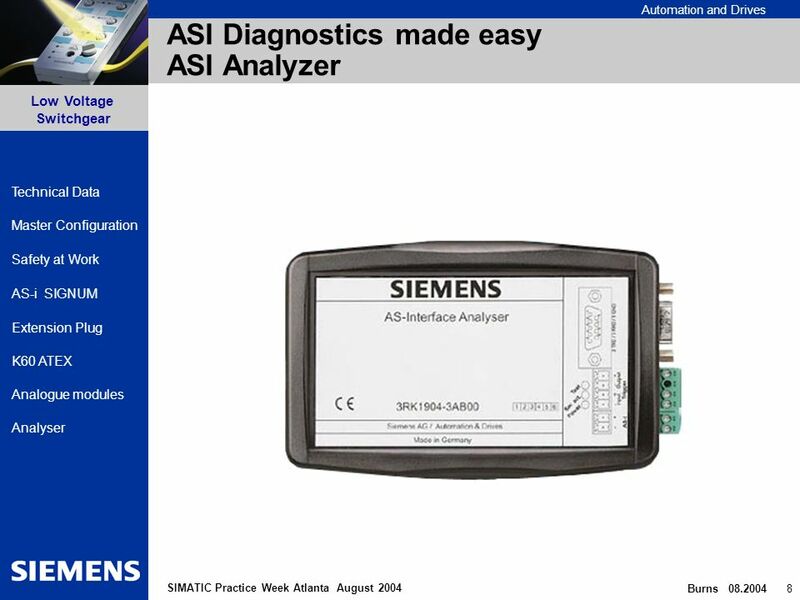 Date: File: PRO1_17E.1 SIMATIC S7 Siemens AG All rights reserved. 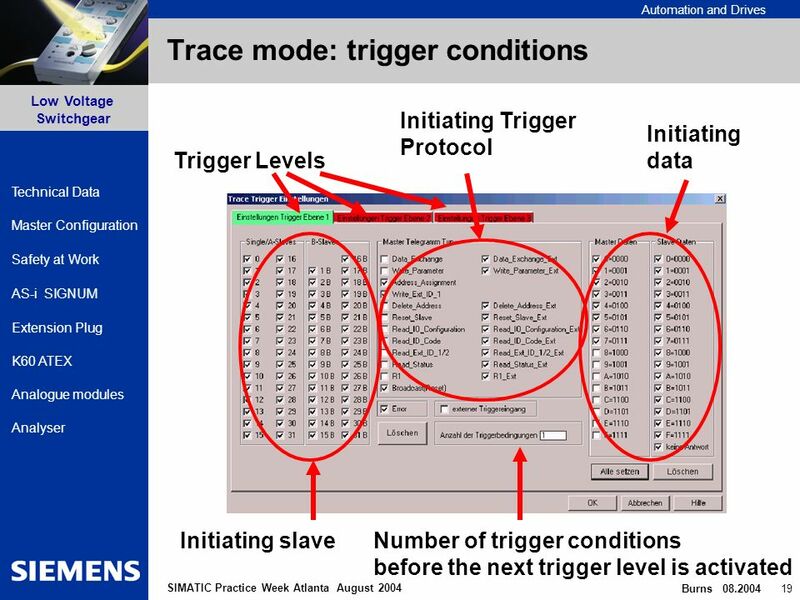 Information and Training Center Knowledge for Automation Solutions (Version.